You know, we've seen in the last week, we've seen Bob Corker, we've seen Jeff Flake ... there are a lot of other people in the Republican Party who feel exactly the same way," Clinton said Wednesday. "And I think when they appear on TV, or they are interviewed, they need to be pressed," Clinton added. Clinton says that the future of the Republican Party is one of her greatest worries now that she is off the campaign trail. "I mean, there are a lot of things that I worry about, this is actually on my list, of what I worry about. The Republican Party is imploding," Clinton continued. "It is becoming a far-right, captive party to ideological religious and commercial interests. It is at the mercy of its financial backers and a cabal of leaders who are doing things like shrinking the electorate, gerrymandering, and taking every step they can to maintain power for themselves and those who are like-minded." Okay—let’s back up a bit. The Democrats don’t gerrymander (they do)? The Democrats don’t have big moneyed interests? The Democrats aren’t a far left party? A small, insufferable urban-based professional left wing elite doesn’t dominate Democratic politics? Only Republicans do this. We all know that's crap; Democrats probably have just as many if not more so-called big moneyed interests in their rolodex. And they're everything else as well. In fact, their fare left lurch on cultural issues is exactly what's keeping them from a successful revival, but that's a story for another time. 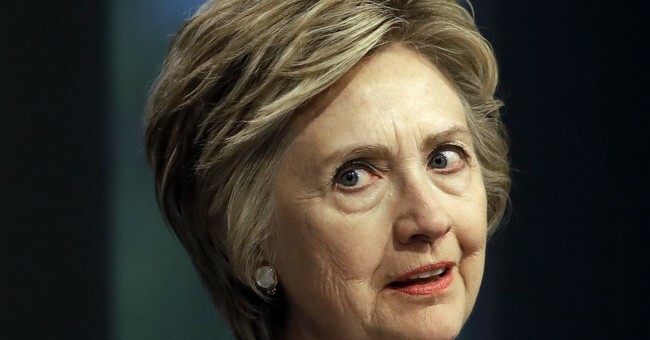 Yeah, I know the double standard, but it’s somewhat funny coming from a woman who was too stupid to campaign in Wisconsin and Michigan, too aloof to truly explain why she had a private email server that was not allowed under the State Department, and too snobby to even reach out to rural voters. Yeah, the GOP is imploding alright—they only control the White House, Congress, two-thirds of the governorships, and 69/99 state legislatures. They’re at the height of their political power, and they’re the dominant political force in the country. The Democrats are now a regional and urban-based party that is in no shape to be a governing force. They’ve lost 1,000 seats since 2009. Citing the departures of Bob Corker (R-TN) and Jeff Flake (R-AZ), two senators who are quitting because of Trump or the state of the GOP, is hardly indicative that the party is imploding. Also, it’s a bit odd, given that Corker and Flake find Trump so awful that they’re probably going to support his massive tax reform package, which just adds to the notion that they’re a bunch of quitters. Hillary thinks the Republicans are splitting into factions. There’s really no evidence to suggest the party is heading for the 1968 crackup that engulfed the Democratic Party.